Are you setting your blog & online business up for success? One of the best ways to save time, money and energy is to uscone the right tools for your online blog business. Confession: I used to be stuck in the mindset of “doing everything by myself” and being very hesitant to invest in tools that I know will help my business. Today, I trust in my abilities to make smart decisions for my blog business. Invest in the necessary resources that will propel your business forward and save you time, friend! It was a tough fight of deciding which tools will get “selected” (and many sleepless nights for me). 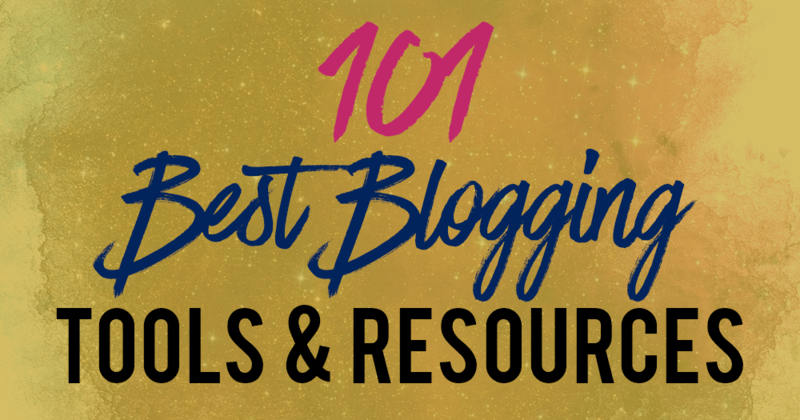 After a ton of sweat and curation, I’ve narrowed down a few hundred contestants to 101 amazing blogging tools that you can benefit from. For ease of use, I’ve split them into several categories for your convenience as well. Note: Some of these are affiliate links, at no additional cost to you. 2. Momentum: I love this. This is a free chrome extension that replaces your new tab page with a personal dashboard featuring a stunning photo backdrop, the time, and your personal to-do list. 3. Self Control App: A free mac application that allows you to block your own access to websites. 4. Mindmeister: Mindmapping software to create amazing mindmaps and organize your mind. 5. Meistertask: Great for getting things done, displays to-dos and projects in a kanban style dashboard which I find really useful. 6. Trello: An alternative to Meistertask. 7. Google Calender: Free calendar by Google to schedule your time wisely. 8. Focus Booster: Based on the Pomodoro technique, focus booster will empower you to maintain focus and manage distractions. 9. My Hours: Helps you to keep track of where all your time is going for free. 10. Unroll.me: Easily unsubscribe from multiple mailing lists you are currently subscribed to and go on an email inbox detox today. 11. Sidekick: Sent an email to someone and wonder whether they opened it? Use sidekick and you’ll now be notified when the person has opened your email. 12. Dropbox: Free 2gb cloud storage of your files. You can also use dropbox to store your freebies/ pdfs/ videos and send the link to your readers to access it. 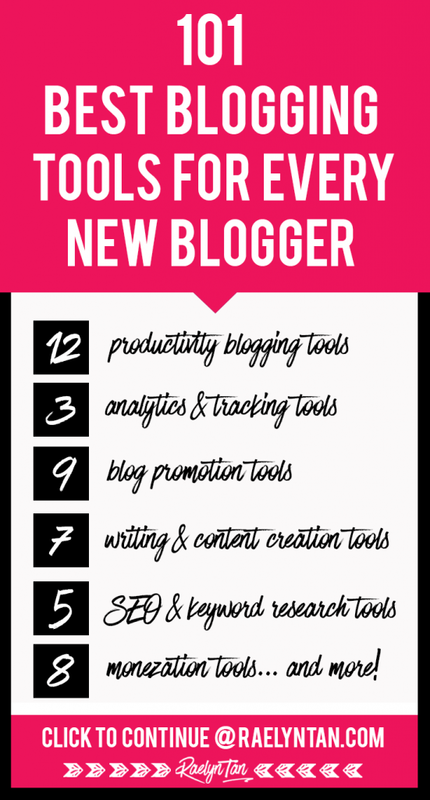 I am LOVING this ultimate list of 101 blogging tools!! 13. Google Analytics: If you aren’t using Google Analytics to track your website stats you need to start. The best analytics tool for website owners, hands down. Get data on your website visitors. It’s 100% free too! I highly recommend this. 14. Sumome Heatmaps: Because it’s fun to see what people are clicking on at your blog. 15. Statcounter: Great for small blogs, as it allows you to see who has visited your website, where they’ve came from for each and every visitor in chronological order. 17. Camtasia: Similar to Screenflow, this is a video editing software as well, but for PC users. 18. Logitech c920: Looking professional on video is a must for me. This makes a world of difference when I’m filming video trainings or holding webinars – from dark and grainy to HD and superb quality! Bonus: When I’m overseas my loved ones get to see me in HD. 19. Blue Yeti Mic: It looks super cool, and the sound quality is awesome! Great mic for entrepreneurs. Blue Yeti tutorial here. 20. Lighting Kit: I recommend this lighting kit when filming videos so that your face isn’t dark and it looks professional. 21. Canon t3i: My camera which I use to film all videos that do not involve me sitting by my computer. 22. Society 6: Coolass video tapestry backdrops that aren’t as ugly as the dreaded greenscreen. 23. Picmonkey: Mad love for creating beautiful graphics for free! Super simple to use too. 24. Canva: Allows you to create beautiful graphics for free too, has nice templates but less flexibility than Picmonkey. 25. VSCO Cam: An amazing free app for editing your Instagram pictures to get a uniform look for your instafeed. 26. Adobe Photoshop: The best tool (and unfortunately the priciest) to create graphics. Serious. 27. PDF Escape: Create fillable forms on your PDFs for free. 28. Tinypng: Compress png & jpg pictures without losing picture quality before uploading onto your blog to reduce your site speed. 29 – 31. thestocks.im, pixabay and unsplash: An amazing collection of royalty free and beautiful stock images for your blog. 32. Dimpleart: High-quality caricatures for your marketing efforts. 33. Coschedule’s Headline Analyzer: Amazing headline analyzer that tells you if you’ve a good blog post title or not. Great for writing better headlines! 34 – 35. Portent’s Content Idea Generator & Tweak Your Biz Content Generator: Ran out of ideas for content creation? These title generators will come up with whacky, amazing titles for your blog posts that will appeal to your audience. 37. Open Live Writer: Open Live Writer is a free powerful, lightweight blog editor that allows you to create blog posts, add photos and videos then publish to your website. 38. Getblogo: Powerful desktop publishing tool for Mac. 39. Transcribe: Audio to text transcription service. 40. Google Keyword Planner: Nothing like searching for keywords using the tool created by big G himself. 41. Semrush: The very best SEO tool available. Research on your competitors, do keyword research, and much more. 42. Long Tail Pro: Find Long-tail keywords with this software. 43. Ubersuggest: Google suggestion on steroids – find lots of keyword suggestions for a given keyword! 44. WordPress SEO by Yoast: Best SEO plugin for WordPress users. 45 – 47. Buffer, Hootsuite & Edgar: Social scheduling tools to schedule things onto Facebook page/ groups, Twitter and more in advance. 48. NextScripts: Social Networks Auto-Poster: When you publish something new, this free WordPress plugin will automatically publish it onto multiple social networks. 49. Uptime Robot: Monitors your website and informs you when it is down, for free. 50. Filezilla: My favorite FTP client that’s 100% free. 51. Gtmetrix: Analyze your website’s speed and performance and makes recommendations on how to improve it. 52. Google Alerts: Get alerted when your keywords/ website name is mentioned on the web. 53. Updraft Plus: Backup your website.. don’t take a risk that you should not be taking. 54. Google Webmaster Tools: Mostly allows you to see what keywords you are ranking for, add your sitemap and to be notified on anything Google wants to tell you with regards to your website. 55. PopupAlly: Craft free and beautiful popups for your website. 56. The Desire Map: This book has really helped me gain clarity on my dreams and core desired feelings. As a result, I’ve gotten a lot more motivated and driven. 57. Psycho-Cybernetics: My mentor recommended me this book to reprogram your subconscious mind and go from being uncertain to being 100% sure that you’ll be successful in your online business. Get over your subconscious blocks. 59. Turbo Blogging & Business Mastermind: My free Facebook group where bloggers like you can ask all kinds of blogging & business questions + get support there. 60. Kickstart Your Blog: This course is for you if you’re a new bloggers looking to start, launch and grow your blog + business. For just $47, you will get access to over 23 step-by-step, over-my-shoulder video tutorials… which would cover essential blog + business topics such as how to launch your blog, which plugins to download, how your site structure should be like, suitable beginner blog traffic strategies, building your email list, crafting your monetization strategy, and much more. 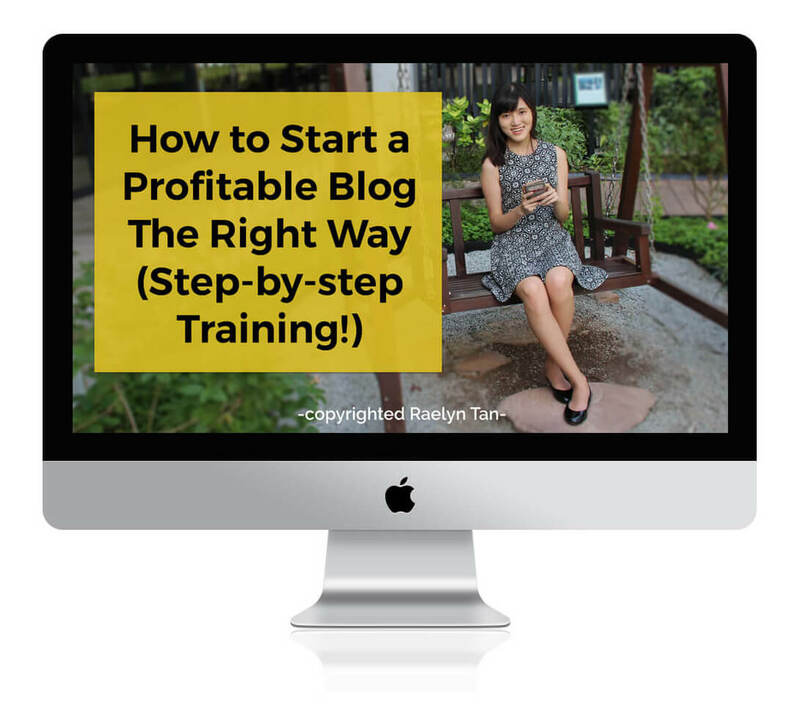 Click here to kickstart your new blog and start transforming your online business game! 61. Traffic Subscribers Yours: The best possible course you can ever find about growing your blog traffic and email list. It is my complete step-by-step system to grow your audience and get your first 1k subscribers, from my 10 years of blogging experience and helping hundreds of students with their visibility online. Click here to enroll to get a roadmap to grow your traffic and email list exponentially! 62. Your Stunning Website: If you purchase Divi (top theme for new bloggers and entrepreneurs), it will cost you $249. I know this can be quite cost-prohibitive for some of you, so I created Your Stunning Website, my done-for-you website kit. You will get the Divi theme as well as the Your Stunning Website template for $147. I will install Divi to your website (I have a developer’s license) and the theme will update itself automatically, so you will have it for as long as you leave Divi on your site. 63. SiteGround (Hosting): My recommended host as of this point of writing (Update Jan ’18: It’s been 2 years, I’m still with SiteGround and I’m still in love!). This blog is hosted on Siteground. Excellent support, 1-click WordPress installation, 30-day money back guarantee, affordable prices. For more guidance, check out my tutorial on how to start a blog. It has been shared more than 50,000 times and has helped thousands of entrepreneurs start their websites successfully! 64. 1&1 (Domain Names): Get domain names here $0.99 for the first year. I like buying domains from this provider because of the cheaper 99cents price for the first year. If you’re like me and buy a gazillion domain names every time an idea strikes your mind, having this lower first year cost is very helpful because you won’t need to spend so much only to cancel your domain name for 98% of your ideas. 66. Mailchimp: They’ve a free plan if you’re on a tight budget and just need a bare-bones email solution. 67. Teachable: I use Teachable to run all my courses. It is an all-in-one course hosting solution to sell your digital courses – complete with sales page, video hosting solution and more. I cannot praise Teachable enough and I can’t believe I waited till recently to switch! I have received so much praises from my course students about how my courses are so much easier to navigate now. Click here to sign up for Teachable if you’ve been looking into creating and selling your very own online course. I 100% recommend this! 68 – 69. E-junkie & Gumroad: Sell digital downloads with ease without any hassle! 70. Calendly: Calendar scheduler software to book appointments with your 1:1 coaching clients. 71. Vimeo Plus/ Pro: Host videos that you want to keep private and/or sell on Vimeo! 72. Skype: Talk to 1-1 clients with Skype! Free and easy to use. 73 – 74. Paypal & Stripe: Payment providers to collect your money. Paypal is the most established and common, but has been known for keeping payments from people. Stripe is a very good alternative. 77. Shareaholic: Great + free social sharing plugin. I use this at the end of all my posts to get people to share my stuff. 78. Wisestamp: Generate a free email signature and get more readers when you’re sending emails without lifting a finger. It’s like your walking billboard online. 79. Manageflitter: Allows you to follow and unfollow really targeted users on Twitter, schedule stuff on Twitter to grow your Twitter following. I love this. 80. Boardbooster: Automatically pin stuff on autopilot with Boardbooster, the pinning scheduler I use and love dearly – get 100 pins for free here. 81. Triberr: A social network of bloggers where the more you share other people’s content, the more they’ll share yours. 82. Buzzsumo: Find the most shared content for given keywords or any competitor’s website. 83. Social Warfare: Social Warfare is a social sharing button plugin that is uber flexible and light-weight. Allows you to control which image will be pinned, allows you to pre-populate what tweet pops up when the person clicks on the tweet button (can even add images) I use this for my website and love how it doesn’t slow down my site unlike the alternatives I listed above. I highly recommend this! 84 – 85. Feedly & Bloglovin: A place to organize, read and share content + find some new blogs. 86. Pocket: Save articles, videos and more to read later with Pocket, it’s also free. 87. Scoop.it: Create boards of curated content based on topics you choose, share your thoughts on those content, and connect with others with similar interests. 88. Surveymonkey: Create conventional online survey forms. Well-established. Learnt so much from this list of 101 blogging tools – check it out! 90. Leadpages: I’m a big fan of Leadpages, because it helps you to create high converting landing pages, thank you pages, webinar pages, sales pages and more real quickly. The boxes that pop up when you click on something in my homepage are Leadboxes, and they’re converting like mad for me! There are other competitors, but Leadpages is by far the most comprehensive and flexible. Check out my review on Leadpages here. 91- 92. Optimizepress & Thrive Landing Pages: Other alternatives for Leadpages. 93. Themeforest: Lots and lots of amazing themes for a good price. 95. Thesis: Theme frameworks that give you more customizing power, optimizes your site for SEO and many other features. The thesis framework comes with several child themes. 96. Genesis: This website currently runs on the Genesis framework with a studiopress child theme. I love Genesis — in fact, my traffic even went up just from changing themes (previously, I was with Thesis). If you have some coding experience or you’re ready to hire someone to help you personalize your site – Genesis is a GREAT option. It is the fastest theme I’ve seen and it is backed by a great group of professional developers… I highly recommend Divi or Genesis, depending on your current proficiency with websites. 97. Google hangouts: Webinars on a budget (aka free), or even to talk to clients. 98. Chatwing: Provides a chat client for you to use during your google hangouts. Use Chatwing together with Google hangouts to give your audience a full webinar experience. 99. Webinarjam: Kickass webinar service. It sends out email reminders for me, and hosts my webinars on their servers, and a ton of other features. 100. Hubstaff Talent: Hubstaff Talent is a free directory for remote workers – this platform has zero fees and have been getting pretty good reviews lately! 101. Codeable: I love Codeable because I’ve gotten really good help from there for the fixes I need for my website! The people there are REALLY good at what they do. Can’t recommend this enough. 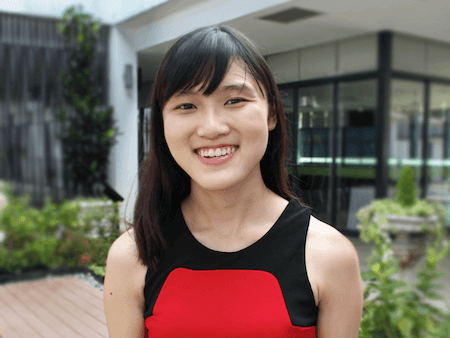 Related post: My friend’s Janice’s post for more blogging tools that’ll save you time! Too many tools and still not too sure which one to use? Download your FREE bonus PDF below: A PDF of the list of tools that I use for my blog + biz which I absolutely LOVE! Hello Raelyn. This is an exceptional list. Thank you. Good info. Lucky me I recently found your website by chance (stumbleupon). I’ve book-marked it for later! Thanks Carter. Yes I got a ton of traffic from Stumbleupon recently – Thanks for visiting! Unroll me was a big help. Thanks for the list Raelyn. I especially like how you highlighted and linked to all of your recommended resources. Very helpful. Extremely easy to scan for quick reference. Thank you for this awesome article. This is simple and easy for quick reference as you categorised it. I loved it. Hi Raelyn, dropping by to tell you that I loved your post! I love simply adore blogging!! I consider Some of them are very essential to start a blog and the rest are requiresd to scale the growth of any blog. Thanks for a huge list. Raelynn this is a phenomenal list. Love it. I learned years ago to use effective tools, for saving time and energy. Gotta do it if you want to scale effectively. But it took some nudging because I used to be a micro manager LOL….learned the hard way; tools are cool if you use the right ones for your blog. Hey Ryan! Thank you for your kind words. Do you accept guest posts on your blog? I would love to! Hi, thanks for the extensive list. I am new to blogging and find the information you provide very useful. Do you use the Open Live Writer? Are there any other free alternatives? I find it time-consuming transferring my posts from Word or Google docs to WordPress. There has to be something easier that I am not aware of. Curious about Triberr. Do people still use it? I signed up and it seemed pretty empty when I was looking for opportunities there. Thoughts?